Fun and interactive activities that supplement a unique look at the science of interplanetary travel! This guide includes a word search, a design-a-spaceship art activity, and cards and markers for a rousing game of space bingo, and is helpful for teaching introductory science and solar system concepts for grades K-2. 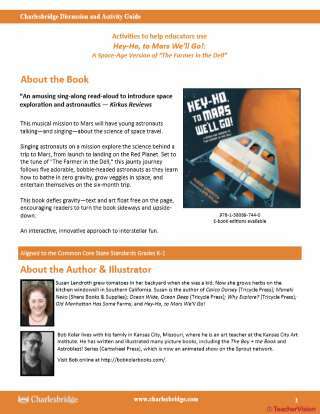 Singing astronauts on a mission explore the science behind a trip to Mars, from launch to landing on the Red Planet. Set to the tune of "The Farmer in the Dell," this jaunty journey follows five adorable, bobble-headed astronauts as they learn how to bathe in zero gravity, grow veggies in space, and entertain themselves on the six-month trip. This book defies gravity—text and art float free on the page, encouraging readers to turn the book sideways and upside-down.